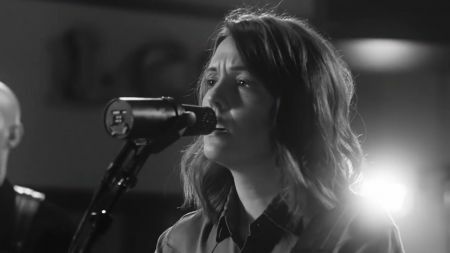 Folk rocker Brandi Carlile has been out on the road promoting her latest album By the Way, I Forgive You and has announced an extension of the tour supporting the album that adds 20 additional performances throughout 2019. Carlile will make a stop in Philadelphia, Pennsylvania on Sept. 6 to perform at the Mann presented by XPN Welcomes. Tickets for the event go on sale on Feb. 8 at 10:00 a.m. with a presale kicking off on Feb. 7. At this tour stop only, Carlile will be joined by gospel singer Mavis Staples as the supporting act. For ticket pricing and availability, click here for event details. Brandi Carlile's sixth album By The Way, I Forgive You was released in Feb. 2018 kicked off with lead single "The Joke." The uplifting song written for people who struggle with societal conformity is just one of many songs that touch on issues we face today. From immigration to addiction, Carlile recorded a rare album of activism and it has been recognized across the globe. The album which debuted at No. 1 on the Rock and Folk Albums chart, as well as No. 5 on the Top 200, earned Carlile six Grammy nominations at the upcoming ceremony on Feb. 10. Nominations include Record and Song of the Year for "The Joke" as well as Album of the Year. Forgive is also nominated for Best Americana Album which she is expected to take home. Not only is Carlile set to perform at the 2019 ceremony, but she will also be part of a star-studded line-up paying tribute to the late Queen of Soul Aretha Franklin.